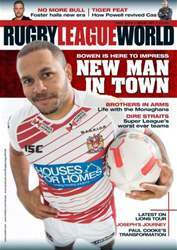 Few players in Super League have had the spotlight cast as brightly on them as Wigan’s new fullback Matty Bowen this year. In replacing hometown favourite Sam Tomkins in the Warriors no.1 shirt, former NRL star Bowen had significant boots to fill. 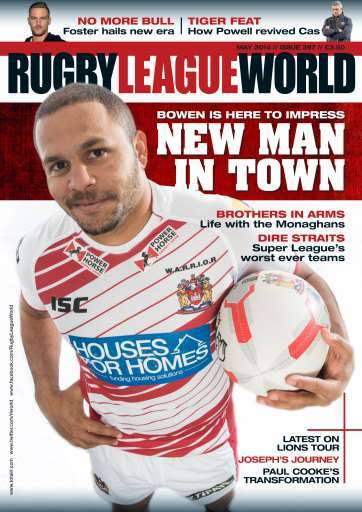 Rugby League World’s Jamie Jones-Buchanan meets up with Bowen to find out how he’s taking to life in Wigan. We also speak to Warrington’s dynamic brothers Michael and Joel Monaghan, and find out how Daryl Powell has managed to transform the fortunes of Castleford Tigers in under 12 months at the helm. Jamie Foster provides an insider’s view on a turbulent couple of years for Bradford Bulls, who are now hoping for a new era under incoming owner Marc Green. Dave Hadfield reveals his worst ten Super League teams and Robbie Hunter-Paul asks whether the World Cup has impacted on some club’s start to the season. Widnes prop Phil Joseph recounts his journey from barman to Super League forward, and in the Championship we find out how Paul Cooke has gone from controversial player to considered coach. With the latest news on a potential Lions tour and the usual round-up from Australia, New Zealand, France and Wales, it’s another packed edition of Rugby League World.